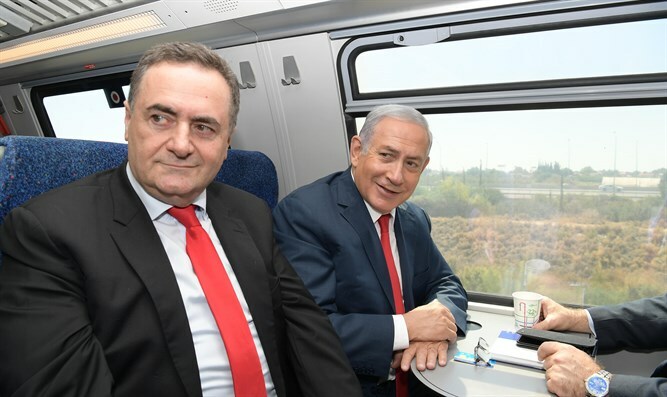 Prime Minister Binyamin Netanyahu and Transportation Minister Yisrael Katz, today (Thursday, 20 September 2018), toured the Yitzhak Navon railway station in Jerusalem and took a test run from Jerusalem to Ben-Gurion International Airport. During the trip, Israel Railways Chairman Dan Harel and Israel Railways Director-General Shahar Ayalon briefed the Prime Minister on the complexity of the project, and updated him on the work that still needs to be done ahead of the opening of the line. Before boarding the train, Prime Minister Netanyahu said: "This is an historic moment, and I use that term carefully, but I have always believed that it is possible to link Jerusalem to the national railway network and not via the old Turkish route that I rode on as a boy and a youth. And here, the moment has arrived after a great effort by the Government of Israel, the Transportation Ministry and all of the elements who worked on it. This truly is a new era. I can only ask that you join the ride and see for yourselves." Prime Minister Netanyahu added: "When I was a boy we used to sing "The Train Flew between the Mountains and the Hills' and today I have the special pleasure of being on a train that flies through the mountains and the hills, and will reach Tel Aviv in the record time of about 30 minutes. This is a new era for Jerusalem and the State of Israel. Come and join [the ride]."